I've been wondering what Color Club had in store for their Spring collection, so I checked their web site and spotted the Blossoming Collection. It appears to be a pastel palette with a shredded silvery holographic glitter included. 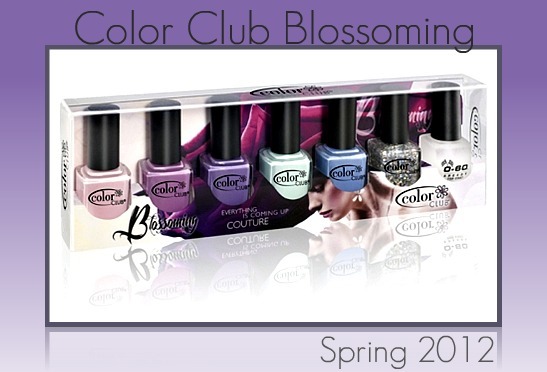 Color Club often releases 2 boxed sets/fourteen shades for their seasonal collections, so I don't know if this will be their only offering for Spring. They released an overload of nice collections in November and December, so this may be it for Spring. Wow so pretty the blue ming need to see IRL . overall the the 5 colors are what I want. Love Spring Collections.Nice post thanks Mary. And I will be stalking my local Ross...My mom is looking for a nice lavender that isn't too gray. Curious where you all get your Color Club polish? I never have seen it anywhere around me at all. We had it at Sally's but only that one Xmas collection made special for Sally's distribution that was scented (but not that much scent which was fine with me). I am seeing a lot of really light pastels for spring. Not sure I like that many light shades - seeing these and Zoya's I only really want the darker end of the sets. I still have so many light shades from French mani days as well as manikin hands days with a few nudes tossed in there after manikin hands kinds of calmed down. They all tend to look a lot alike on me - plus I cannot wear the ones that get that chalky look many of the lighter shades have. So far I like, but I do have to see swatches first so I will keep my eye's peeled now. The Purple shades look yum! Thanks for posting this. Diamond Drops looks like fun! Kind of similar to Fame & Fortune from the Backstage Pass collection, at least in terms of glitter shape? Love Color Club polishes. This looks like it has quite a few I love. Looks interesting! My favorite is Hydrangea Kiss. Wow! Diamond drops is my favorite! Reminds me of NYX Gilded glitter but this as the silver version.